It was bound to happen – rising from the wooden planks of the Santa Monica Pier, surrounded by Bubba Gump Shrimp Co. and carnival food staples (hot dogs! fast-food pizza! ), the first-ever Italian restaurant has popped up on the horizon, with an executive chef with serious gastronomical cred, Giacomo Pettinari. 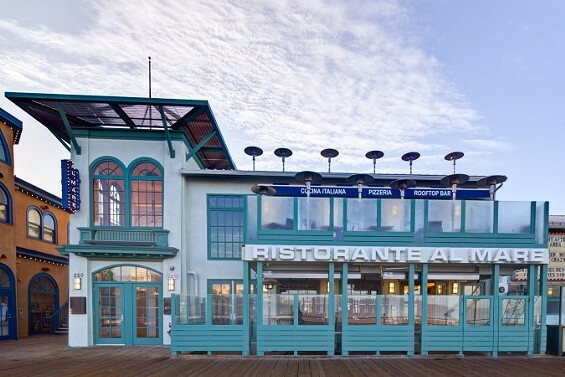 Even though Al Mare a 279-seat ristorante, has been feeding the masses of tourists and locals alike through the holidays, their official ribbon cutting was actually only recently, on March 12. Co-owners Paolo Simeone and Franco Sorgi, who have already seen success with Trastevere on the Third Street Promenade and La Piazza at the Grove, spent over two years completing the build-out of Al Mare, which is designed by local architect David Hibbert. The 9,000-square-foot Italian eatery now stands three stories tall, with second-floor balcony terraces and a rooftop deck boasting one of the best views on the Westside. The space where Al Mare stands has an interesting history that doesn’t involve fine dining or Italian anything….